1) Spot Reducing. You can't isolate the area of your body that you are going to lose fat from. I've see ladies come in the gym and go straight to the leg abductor machine or to the ab machine with the intention of burning off unwanted fat from these problem sites. You can certainly work specific muscles but it doesn't mean the fat you burn will be coming off of these areas. Losing fat takes time and it typically comes off the stubborn spots last that you want it off the most. If spot reducing worked everyone who talks a lot would have lean and slender cheeks and chewing gum would get rid of double chins. 2) If you stop working out, then your muscle will turn to fat. 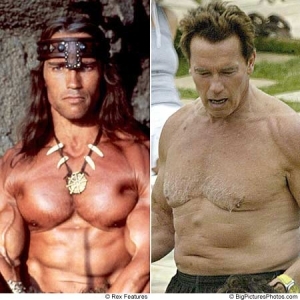 Some people look at body builders (see Arnold above) and athletes before and after their competition days and have jump to conclusions about this. Muscle cells can not turn into fat cells and you can not turn fat into muscle. You can burn fat cells and increase the size of your muscle cells (hypertrophy) but you can't convert them into each other. You can't change an apple into an orange and you can't turn muscle into fat. You can lose fat and build muscle or lose muscle and gain fat. Whichever one you do will depend on your lifestyle choices. 3) Women who lift weights will bulk up. I addressed this last month. Many women fear lifting because they think they will look like an East German Shot Putter. If you lift heavy weights while taking steroids and eat a lot more than usual you might bulk up, but regular resistance training will strengthen muscles, burn calories, and give you a better appearance. 4) In order for exercise to be effective it needs to hurt. We've all heard "no pain no gain." Others say you need to sweat profusely. You can still benefit from moderate exercise levels. Exercise doesn't have to be painful in order to improve your health, although intense exercise will cause a quicker response from your body and obviously burn calories faster than doing moderate activities like walking. There is good pain like pushing through a heavy lift or feeling a little sore after a workout and there is bad pain like feeling a sharp pain or exercising with an injured body part. Learn to differentiate between the two. 5) It takes a long time to get into shape. Surprisingly when you start working out your body makes improvements quickly. Usually if someone sticks to an exercise and nutrition program for 2 to 3 weeks they can notice discernible results in their strength and conditioning. Persistent and consistent effort is obviously needed for continual long term progress, but your body is very forgiving, so it doesn't take years to get into shape. At the other end of the spectrum, watch out for people who promise immediate results in just a matter of days. You still have to pay the price to get results. 6) You need super high amounts of protein to build muscle. Protein is an essential building block and if your body is growing or under a great deal of physical stress it may require more, but many people overcompensate and consume too much. Remember that excess protein can mean excess calories and can cause weight gain just like consuming excess fat or carbs. 7) The more you exercise the better. It is possible to overdo a good thing. Water is good for you, but if you drink too much it can even be fatal. It's also possible to over train and set yourself up for injury if you exercise too much. Remember to give your body time to recuperate and rest. These myths are perpetuated when we take someones word about fitness without getting all the facts. There is a lot of conflicting data out there, so be careful who you listen to. These myths may also be perpetuated by fitness magazines, the big guy at the gym, supplement manufacturers, or even know it all personal trainers like myself. If you doubt what you've heard about a particular subject ,even if it's from a good source like Your Fitness Quest, then I encourage you to do some research and find out for yourself. I enjoyed reading this. I've always been afraid to lift heavy weights coz I thought that it would make me bulk up when I only want to tone my muscles. Most esp my arms. I have a question though...what arm exercises would you recommend for toning? And how many reps and how many lbs. should I use? Julie, some good arem exercises are dumbell curls, bench dips, kickbacks, and french curls. The biggest problem most people have with getting toned arms is not so much gaining muscle as it is loosing fat around the arms.You are already trim so you have that to your advantage. If you are just starting, I'd do 2 or 3 sets of whatever weight you can lift for 10-12 reps. If you can do more reps than that, then it's time to boost up the weight. After a couple weeks, don't be afraid to go heavier with fewer reps in the 8-10 range. thanks Tom, so if it gets lighter, I keep moving up to a heavier weight? I've been lifting 15lbs and do 4 sets/12 reps. The reason many body builders have bodies that look that awful is STEROIDS. Unfortunately that's why there is the myth of gaining fat if you stop working out. The truth is you won't get fat but your metabolism will slow down. Did someone really believe number 2? You nailed a lot of the common myths. All are prevalent but I think people still believe most in spot reduction and that most still believe in excess protein consumption (especially men).